Aerial view of new Fein multifamily in LaCenterra at Cinco Ranch, a mixed-use project by Vista Cos.
HOUSTON – Martin Fein Interests Ltd. a Houston-based multifamily development, construction and property management firm has opened The Grand at LaCenterra Apartment Homes, a 271-unit community in Cinco Ranch west of Houston. 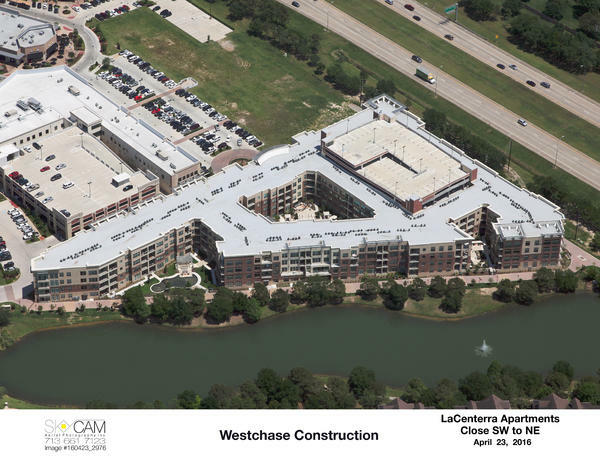 The new multifamily development is located within LaCenterra at Cinco Ranch, a 34-acre mixed use town center developed by Vista Cos. in Katy, Texas. The Grand at LaCenterra is a four-story rental community featuring studio-, one-, two- and three-bedroom units, ranging from 488 to 1,621 SF. The property features expansive lake views and residents have convenient access to their cars as the development surrounds a multi-level concrete structured parking garage. The Grand at LaCenterra provides an attractive housing option to those looking to take advantage of the walkable design of LaCenterra at Cinco Ranch, a major mixed-use town-center destination in Katy. The Grand is located within the 8,074-acre Cinco Ranch master planned community which was ranked #3 on the list of top master-planned communities in the United States in 2013. The property is situated within LaCenterra at Cinco Ranch, bordered by Cinco Ranch Blvd and The Grand Parkway. The location is just south of Interstate 10, within easy driving distance to key employments centers, including the Energy Corridor and the Westchase District. EDI-International, Inc. provided architectural services while interior design services were provided by Moore Design Group of Dallas. Westchase Construction, Ltd., an affiliate ofMartin Fein Interests, Ltd. was the general contractor for the development. Eagle Realty Group, a real estate investment and property management company, provided equity financing for the development while BBVA Compass Bank provided the construction financing. Equity financing was arranged by Hal Holliday of CBRE. Founded in 1989, Martin Fein Interests, Ltd. (FEIN), is a regional development firm that has developed 12,000 apartments in Houston and the Southwest region, including Denver, Tucson, San Antonio and Austin.